An irritable sensation, craving for fluid, a need, a desire, pleasure.. !! La Stoppa is a 50 ha estate situated in Emilia-Romagna (North-West Italy), run since 1991 by Elena Panteleoni and her oenologue Guilio Armani. 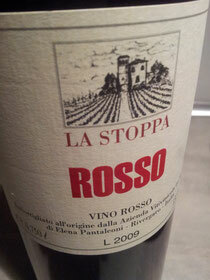 Rosso 2009 is a blend of Barbera (60%) and Bonarda (40%) from 3 to 20 years old vine trees. The vineyard has been re-planted mainly with these two grapes in the 1996. Love it, straight from the opening, even if the wine by itself seems a bit aggressive. Deep open nose, concentrated plumy dark fruit, dark cherry, eupyreumatic notes. Soft attack, very pleasant on the palate, velvety but with a good bite, “ Animal”, a mature style of wine with a good freshness, pulpy with a good length. A wine with instant pleasure, to drink with a friend in a rainy afternoon or to enjoy with a good beef stew or delicatessen and cheese and even by yourself after a long day of work with a good album ( for myself Happy Mondays).